1. The most efficient and economical way of getting from one place to the other in Madrid is the Metro. If you plan on zipping all over the city, buy a 10-journey ticket at any metro station. 2. If you don't have a lot of cumbersome luggage, the hassle-free way to get from Barajas Airport to downtown is via the #8 Metro line that's right at the airport. However, you will have to change trains (at least once) to get to your final downtown destination. 3. Be wary of this scam used by pickpocketers all over the city: you're standing near a park when prodigious amounts of "bird poop" drops on you and two sweet, well-dressed young girls with water bottles and tissues rush to seemingly help you. 4. If you don't want to look like a tourist, don't order café con leche after 12 noon. It's a breakfast drink and should never be consumed with tapas or other afternoon/evening food items. 5. In the much-visited Retiro Park, don't miss the lakeside Palacio de Cristal, a glass pavilion with contemporary art exhibitions. Then wander to the park's east side across Paseo de Duque de Fernan Nunez for lovely gated formal gardens with peacocks, pergolas and water features. 6. On the south side of Retiro Park, you’ll find plants from all over the world as you wander past shady dells in the Royal Botanical Garden. 7. Near the airport but well worth the trip, El Capricho Park, open only on weekends, is known for its French, Italian and English-style gardens. It’s easy to spend the afternoon wandering around the shady grounds. 8. Giangrossi (Calle Velazquez, 44) is an artisanal ice cream chain that's usually packed but worth it to sample the many unusual and refreshing flavors, especially the mandarin and other fruits. 9. If you are a pastry fan, check out Mallorca (in Salamanca neighborhood on Calle Serrano), a chain store that has a wide array of miniature pastries, including éclairs, Napoleans and cream puffs. 10. Valentin del Barrio (Calle Moratin, 20) is an upscale leather goods shop (with a workshop downstairs) selling everything from portfolio cases to journalist's note book covers. The family has been in the leather business since 1934. 11. Chocoholics should look no further than Cacao Sampaka (Calle Orellana, 4) for a quick fix of everything to do with the cocoa bean, including a shop to by gift items. These are great tips, just what I'd want to know about if traveling to Madrid. I'd be afraid to stand still in parks, after reading about the bird poop setup! The look of your blog is great, but, FYI, I'm one who does find the white on black a bit tough on the eyes. Hi Barbara, Thanks for your comments. Glad you find the Madrid tips useful. 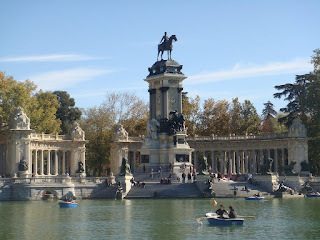 From Madrid... nice blog Jeanine, I think I´ll come by again, I like traveling as well. About your tips on the city... I'd disagree just on #4, it's not that strange to order "café con leche" (coffee with milk) at the afternoon, as "café solo" (expresso) may be too strong for many people. There's an intermediate type of coffee, called "café cortado" (cut coffee), very common at the afternoon: an expresso with a little bit of milk. One more tip: at the Retiro you can find the only statue in the world (at least so they say) dedicated to the devil, as "the fallen angel"
I think Madrid it's a safe city, but it's true that tourists should be very aware of pickpocketers in the center. Hi Victor, Glad you stopped by. Spain is one of my specialties, so I post alot on it. And thanks for your coffee comments. Yes, I agree. But so many of my Madrid friends and colleague joke about tourists, including myself, who order cafe con leche in the afternoon. And I've seen the amazing "fallen angel" statue in Retiro. Thanks for mentioning it. Yes, I find Madrid to be overall a safe city as well.